This word from Jay Strother summarizes the problem that modern churches face today. While we can’t argue that God has worked in even age-segregated churches and programs (in other words, churches that send children and youth away from their families to be discipled), we’re called to discern whether “the way we’ve always done it” is, in fact, the best way. Our own denomination is seeing a generation gap in most of our churches, suggesting that a method used thirty years ago to reach and disciple children and youth was somehow faulty, and as we consider what this means for the future, we would all do well to seek out better options. 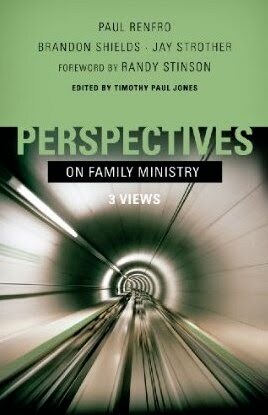 Perspectives on Family Ministry is a book that tackles this subject with cutting-edge ideas and insights. If you’ve never read any of the “Perspectives” books, it will be helpful to know how they’re structured before you begin reading one. A theological topic is given, and pastors/theologians with differing perspectives all write an essay from their stance. Each pastor ALSO writes a critique of the other essays and a final defense of his own, in light of the discussion generated by the other writers’ responses. Because of this, the book ends up reading like a debate, which really helps readers to look at all sides of the issue. So, what is the solution to the family ministry problem? What exactly IS the family ministry problem? The problem, as many youth ministers across the spectrum will agree, is that many modern day youth ministries focus on program-driven agendas that are heavy on the hype and light on the discipleship. Ministries of this type produce a multitude of students who are spiritually shallow and ignorant of even basic tenets of the faith. We’ve seen the effects of this lack of discipleship in the church’s “missing generation.” Simply put, the kids are entertained at church, grow up, and never come back. Why? Because there was never any solid, real discipleship. (And I would argue that there was never any true redeeming faith in these circumstances.) While I know this is not the case everywhere, it is an all too familiar reality for many churches, and the blame CANNOT be laid at the feet of well-intentioned ministers and pastors who simply didn’t know another way to do ministry. Haven’t we always done it this way — drop off your kids, go away, and come back to find that we’ve turned them into spiritual giants through our pizza parties, laser tag, and lock-ins? This book presents three very different solutions to the problem. The first solution, as argued by Paul Renfro, is family-integrated ministry. In a family-integrated church, children and youth are never sent to Sunday school, youth group, children’s worship, or other programming. Family-integrated churches don’t have any of these programs because their core philosophy is that the discipleship of the family is the Scripturally-mandated responsibility of the father and no one else. The church worships together, all generations in one room, and children and youth learn from parents and other believers. Men meet once a month for training in how to disciple their families, and small groups meet once a week in homes. Other than that, though, there are no meetings, giving more time for discipleship within the family. One of the weaknesses of this model is that it targets mainly intact, nuclear families, which are becoming a rarity in our modern society. Wes and I had the opportunity to visit a family-integrated church, and we were all but ostracized for our decision to practice family planning and to send our children to public schools. (And I got some looks for wearing pants. Ha!) The atmosphere (while incredible because children behaved well and certainly knew their Scriptures) is not very inviting to a lost world. Another solution, as argued by Brandon Shields, is the family-based ministry model. I felt at most points in Mr. Shields’s essay that he was fighting against the family-integrated model, suggesting that they had no heart at all for the lost and suggesting even further that we as a church must become like the culture in order to reach it. (Something the family-integrated church is adamantly opposed to.) The family-based structure doesn’t differ too much from the current structure found in most churches. People are still segregated by age, ministry to youth and children is still heavily program-driven, and parents are given little, if any, instruction in discipling their children. There are a few programs aimed specifically at children/youth and their parents, an effort to unite the generations to some degree. As mentioned again and again in Mr. Shields’s essay, families of all types and backgrounds feel comfortable in a family-based church. The final solution, as argued by the above-quoted Jay Strother, is the family-equipping model. Mr. Strother calls this model “the little brother” of the family-based model, explaining that many of the same concepts and philosophies of that movement are prevalent in the family-equipping model, with some significant changes. In this type of church, there is still age segregation, but parents are well-informed and included in ALL aspects of the church’s involvement with their children and youth. Classes that specifically teach discipleship and topical issues of parenting are offered, teachers are in constant communication with parents, and there is a great focus church-wide on PARTNERING with parents as they do what God has called them to do. This model seems, in every respect, to be the “in-between” option, sandwiched between the two extremes of family-integrated ministry and family-based ministry. No matter what your opinion on which model is best or how the modern church should adjust to meet the needs of a new generation and re-connect children and youth with their parents, I’m sure you would agree that thinking through and discussing these issues is beneficial for everyone. I would highly recommend this book, not because I have all the answers or could point to the “best” model. (I wonder if there IS a best model since they all have such strong points!) I recommend it because it’s invaluable to us, as people of God who love children and youth, to consider how to best reach them and disciple them to bring glory to God. It’s a challenging but significant read. After reading about these three models, what category does your church fall into? What are some of the best traits of this type of model? wow that sounds like an intense read. Thanks for sharing. I would say that my church is probably the family-based one. Personally, I would probably fit in best with the family-integrated one (I don't use birth control or wear pants and we homeschool, so I alreay have that in common with them! ha!) Just curious, what denomination was the family-integrated church you attended? And where was it? It was Grace Family Baptist Church in Spring, Texas. (A suburb of Houston.) Voddie Baucham is their senior pastor. We really respect his teaching and the ministry he has there but found that they didn't have many suggestions for typical Southern Baptist churches (like ours) on how to transition to a more family-integrated approach to ministry. It was really an all-or-nothing way of looking at, and most churches can't go from age-segregated in everything to nothing without some transitional steps and helps along the way.